Are we unfit for marriage? This week we explore marriage, the fears of long term commitment and why we think we'll never get married. Eddie teaches us all about Canadian marriage traditions and we introduce a new music track for one of our usual segments. 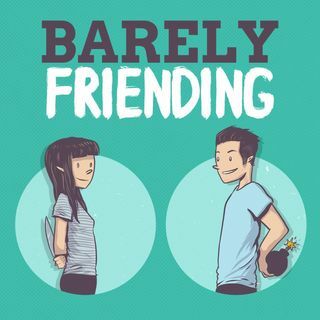 The Barely Friending Podcast is hosted by comedians Eddie Della Siepe and MJ Riggins. Follow them on Twitter, Instagram, and Vine! Check out "Tinder Nightmares" by Bill Dixon and Elan Gale. Link here: http://www.amazon.com/Tinder-Nightmares-Elan-Gale/dp/1419719203.